After the success of the first Winter Ukes du Soleil we are hosting the next one from Sunday 2nd to 9th Feb 2020. It was beyond our dreams to have such perfect weather, company and musical fun. We look forward to welcoming any of you who can come again and newcomers. Please tell friends because we have a few extra spaces. We will continue with the same theme: lots of musical workshops, lots of time to enjoy the mountains on skis, foot, or in deckchairs and lots of delicious healthy and fuelling food! It will be led again by Louise Burnet, who was a major prize winner at the Royal College of Music. She worked as a freelance flute player with the major orchestras for many years in London, throughout the UK and abroad. She has always been active in chamber music, having performed for BBC TV and BBC Radio 3 and in 2016 toured the USA with her trio: Vocali3e. Louise wrote a millennium Gloria and had all the musical members of her community performing. She was asked to write music to celebrate Jon Muir’s centenary and had 100 musicians and singers performing. Louise’s great gift is getting people of all musical abilities to have fun and raise their musical game and the roof! Louise started playing the ukulele in 2015 and has done a musical metamorphosis!! She enjoys the challenge of arranging a diverse variety of music for the ukulele. Louise has always been a firm believer that everyone can sing. Add the ukulele and what is better than singing and playing beside a roaring fire or outside a mountain restaurant in the sunshine!! This will be the 5th Ukes du Soleil week that Louise has led and she never ceases to amaze us with her new repertoires of songs: everything from Vivaldi’s Winter and Panis angelicus, to Scottish music, and popular music from 60s, 70s, 80s and way beyond! The day will be interspersed with workshops and will work towards performing in the open air (weather permitting) outside the mountain restaurants! Before the week begins, we will circulate the chords that it will be necessary to play in order to join in. This is neither a course for complete beginners nor advanced players! It is a time for people who want to create music together with their ukes and voices! The course will run for 6 days. 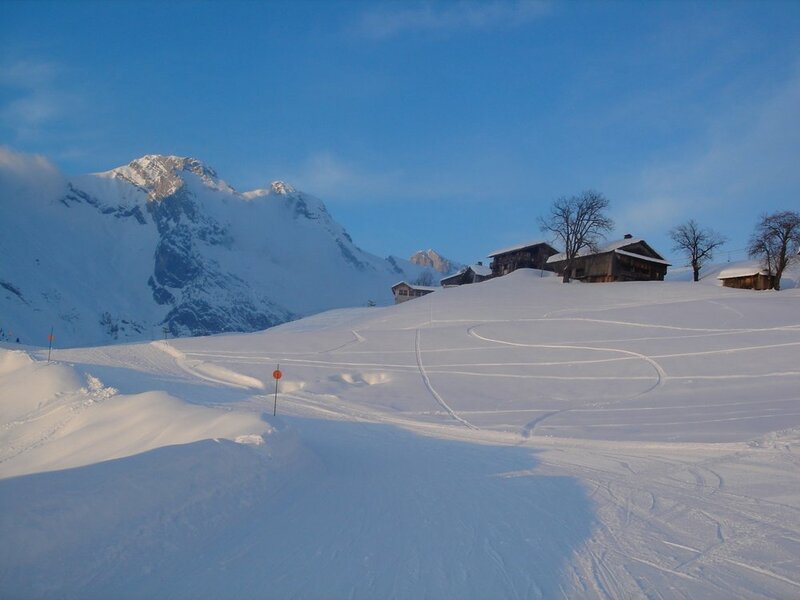 You will be expected late afternoon Sunday 2nd Feb, between 16.00 and 16.30, no later because access is by walking up from the gondola or chairlift and skis. There will be an organised pick up from Geneva airport at about 1pm, in order to get you up to the gondola or to Chinaillon for your passes and skis before the lift closes. On Sunday 9th Feb, for the return, you will leave before 9 am and we suggest flights that depart no earlier than midday from Geneva. This way people can share transport to the airport. The cost of the course including breakfast, lunch on 3 days, and dinner with wine at La Ferme will be £830, assuming you share a room. Tuesday is the staff’s day off. If you would like to join us, please let me know as soon as possible.